After the bombings, Jewell was falsely implicated as a suspect by the Federal Bureau of Investigation and the news media focused aggressively on him as the presumed culprit. However, in October 1996, Jewell was exonerated when the FBI declared that he was no longer a person of interest. Following three more bombings in 1997, Rudolph was identified by the FBI as the suspect. In 2003, Rudolph was arrested and tried before being convicted two years later. Rudolph was sentenced to life imprisonment without parole for his crimes. Centennial Olympic Park was designed as the "town square" of the Olympics, and thousands of spectators had gathered for a late concert by the band Jack Mack and the Heart Attack. Sometime after midnight, Rudolph planted a green U.S. military ALICE pack (field pack) containing three pipe bombs surrounded by three-inch-long (7.6 cm) masonry nails, which caused most of the human injuries, underneath a bench near the base of a concert sound tower. He then left the area. The pack had a directed charge and could have done more damage but it was slightly moved at some point. It used a steel plate as a directional device. Investigators would later tie the Sandy Springs and Otherside bombs together with this first device because all were propelled by nitroglycerin dynamite, used an alarm clock and Rubbermaid containers, and contained steel plates. Security guard Richard Jewell discovered the bag and alerted Georgia Bureau of Investigation officers. Jewell and other security guards began clearing the immediate area so that a bomb squad could investigate the suspicious package. The bomb detonated before all spectators could leave the area. 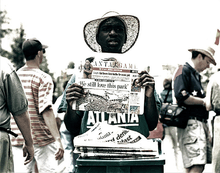 After Jewell was exonerated, he initiated defamation lawsuits against NBC News, The Atlanta Journal-Constitution, and other media entities, and insisted on a formal apology from them. Jewell's lawsuit accused Piedmont College President Raymond Cleere of falsely describing Jewell as a "badge-wearing zealot" who "would write epic police reports for minor infractions." The plate and other clues led the FBI to identify Eric Robert Rudolph as a suspect. Rudolph eluded capture and became a fugitive; officials believed he had disappeared into the rugged southern Appalachian Mountains, familiar from his youth. On May 5, 1998, the FBI named him as one of its ten most wanted fugitives and offered a $1,000,000 reward for information leading directly to his arrest. On October 14, 1998, the Department of Justice formally named Rudolph as its suspect in all four bombings. ↑ Gross, Doug (April 14, 2005). "Eric Rudolph Lays Out the Arguments that Fueled His Two-Year Bomb Attacks". San Diego Union-Tribune. Associated Press. 1 2 Brenner, Marie (February 1997). "American Nightmare: The Ballad of Richard Jewell". Vanity Fair. Retrieved December 6, 2013. ↑ Brown, Aaron & Harris, Art (February 7, 2001). "The Hunt for Eric Rudolph". CNN Presents. CNN. Retrieved December 6, 2013. ↑ Freeman, Scott (August 24, 2006). "A Hero In His Own Mind". Orlando Weekly. Retrieved December 6, 2013. ↑ "JANET EVANS NEARBY DURING CENTENNIAL PARK EXPLOSION". Deseret News / Associated Press. 27 July 1996. Retrieved 12 August 2016. ↑ Mackay, Duncan. "Janet Evans to return to Atlanta as part of 20th anniversary celebrations for 1996 Olympics". Inside the Games. Retrieved 12 August 2016. ↑ Jacobs, Jeff (July 28, 1996). "In Atlanta, Fear Roams Hand In Hand With Anger". Hartford Courant. ↑ "Clinton Pledges Thorough Effort to Find Olympic Park Bomber". CNN. July 27, 1996. Retrieved December 6, 2013. ↑ "Ex-Suspect in Bombing Sues Newspapers, College: Jewell's Libel Claim Seeks Unspecified Damages". The Washington Post. January 29, 1997. Retrieved December 6, 2013 – via Highbeam Research. ↑ "Atlanta Olympic Bombing Suspect Arrested". CNN. May 31, 2003. ↑ "Full Text of Eric Rudolph's Confession". NPR (National Public Radio). April 14, 2005. Retrieved December 6, 2013. ↑ Faulk, Kent (April 8, 2013). "Birmingham Abortion Clinic Bomber Eric Robert Rudolph Fights to Get Profits from His Book". AL.com.